French Onion Beef Soup is not your average French Onion soup, it’s jazzed up like 1000%! Extra meat and extra cheese make this soup over the top! It seems as though most of the country is covered with snow now! Wow, that was quite a storm that blew through. I feel bad for my friends who live in the South. I’m sure that they have been in “holy cow, now what do we do ” mode! This was only our third round of snow this winter in Denver. We only got a few inches so it’s really just more of a nuisance. The below zero temperatures were horrible but now we are back to having our 50 degree days so all is good in paradise! Good news though, the ski resorts are getting dumped on so I can start thinking about dusting off the skis! While we were confined to our homes on Thursday because of snow and minus seven-degree temperatures, I needed to make soup. I seriously needed a hot bowl of soup! I have been craving French onion soup for quite some time now and Thursday seemed to be the perfect day to make it and oddly enough, I had all the ingredients on hand! While I was pondering a recipe to makeup, I thought of a couple things that French onion soup lacks. One, there is never enough cheese and two, where’s the meat? One pet peeve of mine is when you eat a hot bowl of French onion, once the cheese is gone, so is the joy. So why not put a handful of Swiss cheese in the bottom and on the top of the bowl? This way every single bite has the melty cheese in every bite! Genius! Along with my cheese issue, I like to eat soup as a meal. 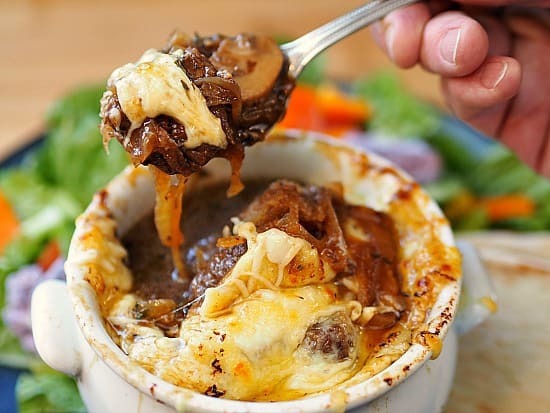 Typically French onion soup is always on the appetizer menu, why not add some chunks of hearty meat to make it an actual meal? Well, I solved my dilemmas with these two additions. Finally, I’m in the boat that the bread that goes into the soup gets too soggy for me. I omitted it from the soup and just served it up with a hunk of French bread on the side! Delicious if I do say so myself! Try this French Onion Beef Soup. It’s like French Onion Soup but so much better!! Are you looking to try another kind of Fench onion soup? Give my French Chicken Onion Soup a try! 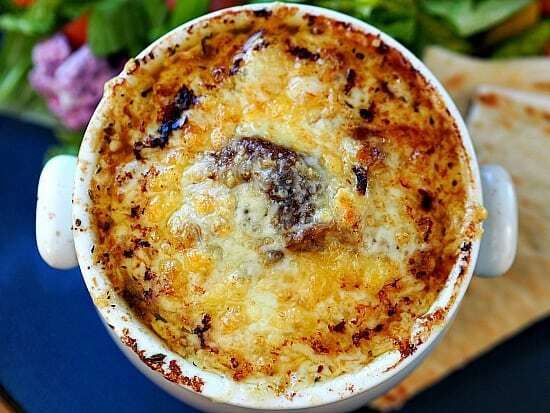 French Onion Beef Soup is not your average French Onion soup, it's jazzed up like 1000%! To make the soup, coat the bottom of a large dutch oven with olive oil. Heat up to a medium temperature. Brown the meat in small batches making sure that you season each batch with a pinch of salt and pepper. Set aside when all the beef is browned. In the same pot, add the butter, onions, garlic, and mushrooms. Cook until the vegetables become soft, about 5 minutes. Add the thyme, marjoram, rosemary, bay leaf, and salt and pepper. Cook for another 5 minutes and add the beef back to the pot. Add the Worcestershire and the wine, scraping up any brown bits from the bottom. Add the beef stock and bring to a boil. Place the covered pot in a 300-degree oven and cook until the beef becomes tender about 1½-2 hours. While the soup is in the oven make the caramelized onions. In a large saute pan on medium-low heat, melt the butter with the olive oil. Add the onions, thyme, marjoram, and rosemary. Stir until incorporated. At this point, let the onions cook stirring every ten minutes or so. Continue to cook the onions until they become a deep golden brown. This will take 45-60 minutes. Add the balsamic vinegar and season to taste with salt and pepper. Set aside. When the beef soup is done the cooking, stir in the onions. To assemble the soup. In 4-6 ovenproof soup bowls add ¼ cup of the shredded cheese to the bottom of the bowl and ladle the soup over the cheese. Top the soup with another ½ cup of cheese. Place the soup under the broiler and broil until a golden brown color is achieved. Serve with crusty bread and make it a meal with a crisp green salad. Double cheese, chunks of meat, mushrooms, caramelized onions… Did I mention double the cheese? Caramelized Onions are easy to make, it just takes time! Worth every minute of it! Hmmm. No butter in the beef part of this recipe but it is mentioned in the instructions. Can’t wait to try this great recipe !! One of our favorites on a cold day and your recipe sounds especially good. Your jazzed up version certainly does sound terrific…I like the idea of adding meat for a really satisfying meal. Clever creation Heather. We have some leftover French onion soup in the fridge which I will now add some beef and mushrooms to then try your whole recipe later. Gawd, I can’t even imagine how good this soup is. And I love your idea of putting additional cheese on the bottom of the bowl.